It’s nice to have a good neighbor willing to cat-sit while you’re away, but if you’re neighbors are not cat people, or your trip is scheduled to be extra long, consider leaving your cat at Happy Tails. At Happy Tails your cat will receive almost a much love and affection as they get at home, and you won’t have to worry about the neighbor forgetting to clean the litter box. Good morning, good morning good morning! 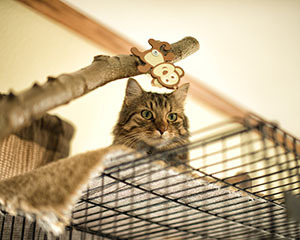 Whether your feline friend is ready to be social yet or not breakfast is served around 8:00am. Science Diet cat food is Happy Tails’ choice cat food, but if you have a picky eater feel free to bring in their favorite cat food or cat treats. First things first, all cat cages are cleaned first thing in the morning. Everyone’s litter box is emptied and each cat is fed and given fresh water. After breakfast and the morning maintenance each cat has an opportunity to get out of their cage for awhile. Cats are let out separately so there’s no need to worry about any personality clashes. 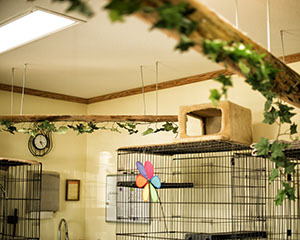 Throughtout the day and depending on the number of cats at the facility, and your cats temperament they will spend anywhere from an hour to almost all day roaming around outside of their cage. Those with a friendly personality find this to be a great time to get that extra affection they’ve been missing since you’ve been gone. Around 9:00pm there’s a chance for one more quick stretch and snuggle and then it’s lights out. Can’t wait to do it all over again tomorrow!